In most OCT systems, one-dimensional (depth) ranging is provided by lowcoherence interferometry [2, 3] in which the optical path length difference between the interferometer reference and sample arms is scanned linearly in time. This embodiment of OCT, referred to as “time-domain OCT,” has demonstrated promising results for minimally invasive, early detection of disease. The relatively slow imaging speed (approximately 2 kHz A-line rate) of time-domain OCT systems, however, has precluded its use for screening large tissue volumes, which is required for a wide variety of medical applications. Imaging speed has a fundamental significance because of its relationship to detection sensitivity (minimum detectable reflectivity). As the A-line rate increases, the detection bandwidth should be increased proportionally, and therefore the sensitivity drops. The sensitivity of state-of-the-art time-domain OCT systems that operate at 2-kHz, ranges between −105 and −110 dB. Most biomedical applications require this level of sensitivity for sufficient depth of penetration and cannot tolerate a reduction in sensitivity to achieve a higher frame rate. 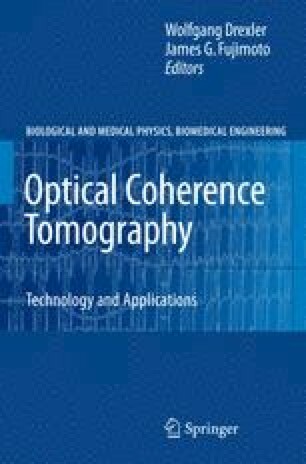 Although increasing the optical power would, in principle, improve the sensitivity, available sources and maximum permissible exposure levels of tissue represent significant practical limitations.